Trying to resolve financial matters can be challenging when going through a separation or divorce. Many people immediately think of court hearings or imagine endless reams of solicitors’ letters going back and forth to try to resolve matters. However, there is another way which involves you and your former partner taking control, with face to face meetings with both of you and your solicitors present, with everyone agreeing to be open and honest and to work together to try to agree matters. The focus is on face to face meetings instead of reams of solicitors’ letters, it is called Collaborative Law. Collaborative Law is not a term many people are familiar with, as the focus over the years has been generally to promote mediation. Mediation is a good way to try to resolve matters however, the mediator cannot provide legal advice and so matters can be delayed whilst people seek advice from their solicitors before being able to progress with mediation. Whereas with Collaborative Law, your solicitors are both present in the meetings with you, to provide legal advice on tap and to help both of you. Also, with Collaborative Law as both of you and your solicitors are involved everyone can drive matters forward, whereas with mediation solicitors may not be kept up to date with what is happening and this sometimes leads to delay. The focus is very much on everyone working as a team to try to resolve the finances or the arrangements for the children or both, with you both being in control of the process. You and your former partner will both need to instruct a collaboratively trained solicitor. Genette Gale, at Rutters is collaboratively trained and can provide you with a leaflet to give to your former partner detailing other local Collaborative Solicitors. There is then a discussion about what will happen prior to the first meeting, as it may be agreed that homework needs to be carried out before the first meeting is held or it may be agreed the first meeting is held to find out what homework everyone needs to do. You and your former partner, with the help of both solicitors, agree on the agenda for each meeting and what needs to happen in preparation for the meeting, so you are very much in control of the process. Face to face meetings will be held to enable you and your former partner to look at how the financial matters can be resolved, both of your solicitors will be present at the meetings. Once an agreement is reached then your solicitors will prepare a written agreement or court order. At the first meeting, it is normal for a participation agreement to be signed which sets out the duties of everyone, you and your former partner and your solicitors will sign the agreement. Included in the agreement is a clause which states that if you and your former partner cannot resolve matters through Collaborative Law and one of your decides to make a formal application to court, with court hearings then taking place, you will not be allowed to use your family solicitor or any other family solicitor at their firm. This clause gives an incentive to you both, to focus on resolving matters, as otherwise, you will both incur more costs instructing new solicitors. The time it takes will depend on the information you and your former partner need to gather together about your finances and then how long it will take you and your former partner to reach an agreement. The time it takes is therefore mainly down to the two of you. Sometimes people imagine applying to court for a judge to hold hearings to decide the division of the finances will be quick. However, our court system is under strain, just like the rest of the public sector. Court can therefore be slow and it is not uncommon for court hearings to be cancelled and moved with little notice due to lack of court time or unavailability of a judge. Whereas Collaborative Law means you and your former partner are in control, you will agree what is to happen to move matters forward and can decide the date of each meeting to fit in with the availability of you and your partner and your solicitors. Collaborative Law has the advantage that you are both in control of the process, as opposed to court hearings where a judge who is a complete stranger will be deciding the outcome, they will not know you or your family, they will have limited tools to help you and may not have even have had the time to have read all the papers you would have sent into court. The cost will depend on how many meetings are needed to take place and whether any expert help is needed, for example, valuation of property by a surveyor or agent, accountancy advice re tax implications or the value of any business or pension advice regarding valuation of pension assets and their division etc. Genette Gale, our family solicitor, will be able to give you an estimate after she has met with you. 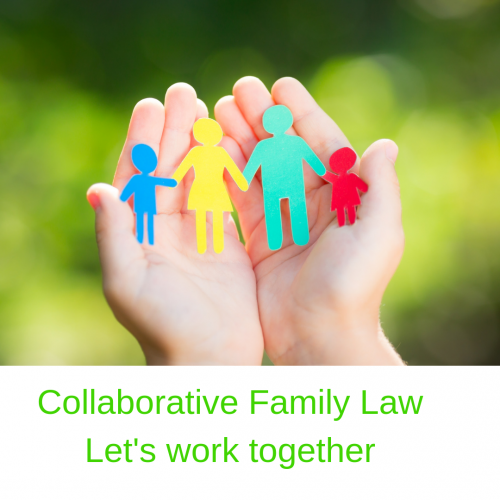 Ring Genette Gale, our family solicitor, on 01747 857303 and she’ll be happy to talk to you about the Collaborative Law process.